Average Americans have had many opportunities to learn where the candidates stand on the issues this year. These include the extraordinary series of 10 Republican and six Democratic debates held to date, along with town hall meetings, massively detailed positions on a wide variety of issues on candidates' websites, and candidates' speeches and interviews. Out of all of this, the question remains: Do average Americans out there, who are taking all of this in, believe that the candidates have come up with good ideas for solving the issues that Americans care about? This is a key question. The fundamental purpose of presidential elections is to put into office an individual who will, in essence, serve as the representative of and conduit for the wishes, priorities and desires of the average people of the nation -- the people whom the president represents. 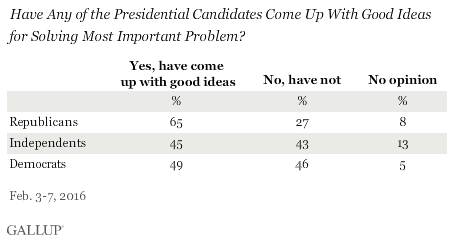 If Americans believe that no candidate has come up with good ideas for addressing the problems that they -- the American people -- believe are most important, then the president-to-people connection isn't working well. And the results of the election are not going to engender a great deal of faith or support from the people. In November, and again in January and February, we asked Americans, just after they told us what they consider to be the most important problem facing the nation, whether they think any of the presidential candidates have come up with good ideas for solving that problem or not. A little more than half of Americans -- 52% -- said yes in February. That's up slightly from January and November. Forty percent say "no," and the rest say they don't know. These views vary quite a bit by partisanship, and this becomes a significant finding. Republicans are more positive than Democrats. 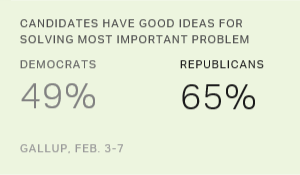 To be specific, 65% of Republicans say a candidate has come up with good ideas for solving the most important problem facing the nation, compared with 45% of independents and 49% of Democrats. The obvious explanation for the higher positivity among Republicans is the larger number of candidates running for president on the Republican side, and the more frequent and more highly rated debates on the Republican side. More candidates and more discussion equal more ideas on the table. It's easier for a Republican to say that at least one of their candidates has come up with good ideas for solving the top problem since there have been so many more candidates putting ideas forth. Plus, our data show that Republicans are giving more thought to the election and are more enthusiastic about voting. If they are paying more attention to what is going on, they are more likely to pick up on candidate positions. Additionally, voting data in the primaries to date also show that the turnout is much higher for the GOP primaries than for the Democratic primaries. Average Republicans have seen at least 17 candidates running for president at points in the campaign, and even now there are five still in contention (Donald Trump, Marco Rubio, Ted Cruz, John Kasich and Ben Carson). That contrasts with just the two major Democratic candidates who have dominated that side of the election (Hillary Clinton and Bernie Sanders), with -- at most -- three other candidates joining them earlier in the campaign. So, to summarize, we have lower Democratic turnout (so far), lower Democratic enthusiasm about the election, lower thought given to the election by Democrats and fewer Democrats saying that candidates have come up with good ideas for solving the most important problem facing the nation. Bottom line: This lack of conviction among Democrats that candidates have answers, along with other indicators of lower enthusiasm about the election, could portend poorly for Democratic turnout next November, providing a distinct advantage for Republicans. Ted Cruz and Donald Trump have both lost popularity among Republicans, while Marco Rubio's image is in better shape and remains where it was in early January. Hillary Clinton has reclaimed her role as the best-liked presidential candidate in Democrats' eyes, eclipsing Bernie Sanders. Asked what comes to mind when they think of Hillary Clinton, Americans most commonly refer to her as being dishonest or untrustworthy. Their most common statement about Bernie Sanders is that he is a "socialist."